In the original 1986 Transformers movie, Optimus Prime dies after a particularly brutal fight against Megatron and the Decepticons. He doesn’t just fall in battle, though; he also gets an extremely overwrought death scene with the movie’s main characters mournfully standing around as he tells them he’s going to Autobot heaven. It is, without hyperbole, the saddest scene in movie history. As the legend goes, Hasbro was so taken aback by the strong reaction to Optimus’ death that it scrapped a similar scene in the G.I. Joe movie (that character fell into a coma instead) and eventually brought Optimus back to life on the Transformers cartoon. Basically, the lesson is that Optimus Prime is very important to some people, and those people do not like it when you mess with him. Michael Bay surely didn’t design this poster himself, but is he aware that the movies he makes typically aren’t super-serious affairs and that the audience rarely needs to ponder his dramatic themes and powerful ideas? Also, that definitely looks like Bumblebee’s arm on the bottom, which is presumably meant to suggest that the little guy is going to get killed by a purple-eyed Optimus. Is this Michael Bay pushing back against the walls of the Transformers series? Is he tired of making dumb movies where things just explode really good, so now he’s trying to bring something more dark and intellectual to the table? 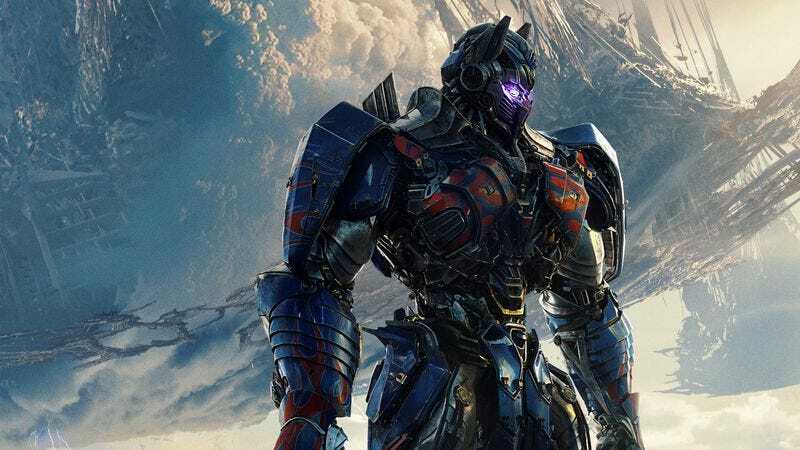 Will Transformers: The Last Knight be the Watchmen of robot movies? We’ll find out next June.